Nairobi — Conservationists and environmentalists have called for speedy investigations into the death of seven black rhinos at the Tsavo East National Park. 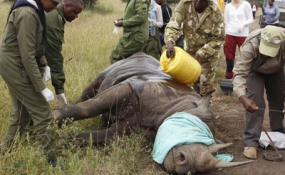 The Chief Executive Officer of Kenyan Conservation NGO WildlifeDirect Paula Kahumbu says this is the worst disaster ever recorded in Kenya over rhino deaths after translocation asking the Tourism and Wildlife CS Najib Balala to acknowledge it as so. "The minister has to say there has been a disaster, rhinos have died. This should be done soonest and not a week or a month later," she said. "This is not the first time that KWS is moving animals and so we deserve to know the cause of death of this precious animal, something must have gone wrong and we want to know what it is," said the conservationist. Kahumbu also called for the translocation exercise to be put on hold until the matter is fully addressed. "Each animal is worth about a million dollars, it's like 7 million dollars just vanished into thin air. Hence the need to halt the exercise to avoid further deaths of the rhino," she noted. The translocation exercise was launched at the ivory burning site here in Nairobi by Tourism and Wildlife Cabinet Secretary Najib Balala.